Mary Gutierrez is on a mission. Every day but Sunday — the Lord’s day — she fires up her wood grill and smoker in a nameless Oakland carwash lot at MacArthur Boulevard and Martin Luther King Jr. Way to hawk tamales for Jesus. Actually, Gutierrez (originally from Puerto Vallarta, Mexico) operates her food stand to help support her family via sales of smoky, chewy-skinned grilled chicken (pollo al carbon), ribs with barbecue sauce she buys at Costco, and the tangy fish ceviche she spoons onto crisp, commercially fried tortillas. But her delicious tamales — those belong to God alone. Gutierrez is a member of Iglesias del Dios Vivo, Church of the Living God. Every week, female volunteers at church’s congregation in Rodeo — Light of the World San Francisco — make about a thousand tamales. Church members are free to take and sell them, with the understanding that proceeds are to be donated back to the church. I stumbled on Gutierrez’ stand earlier this month and thought the chicken tamales ($5 for two) were some of the best I’d had recently: a relatively thin sheath of masa surrounding a shredded mass of nicely seasoned chicken, even better with a few spoonfuls of Gutierrez' own tart, slushy tomatillo salsa. She told me to come back the following Friday, when she’d have pork tamales. But when I drove by the lot last week she wasn’t there. Then, this morning, she was. Again, no pork, but the chicken ones were as good as I remembered. A bonus, as I waited for Gutierrez to warm them in her smoker: Her teenage son, Luis, showed me the Iglesias del Dios Vivo prayer book, with its glossy photos of elaborate churches in Guadalajara and Mexico City — a form of evangelizing, sure, but a gentle one. Or maybe he was just showing me where my five bucks would end up. 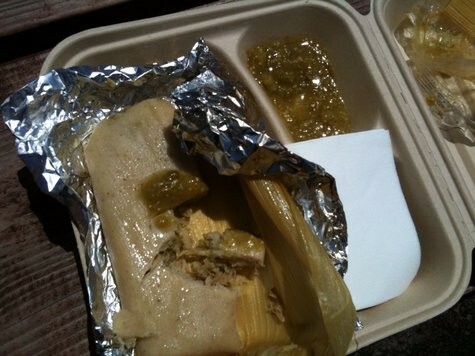 Still, the tamales themselves did a better job of evangelizing than a gilded heap of spires ever could. Praise Him — with a mouthful of chicken and salsa. Look for Gutierrez’ stand to be open Monday through Saturday, from about 10 a.m. till 5 p.m. If you don’t see her? Don’t give up.